It is news when students at one school take four of the six top prizes at a March 12 Mathlete competition held at SS. John Neumann-Maria Goretti High School, open area-wide to eighth graders from Catholic schools. It’s even greater news when that school happens to have an overwhelming African-American student body, and almost closed in 2012 because of low enrollment. The school is Holy Cross in the Mount Airy section of Philadelphia, which is one of the Independence Mission Schools. 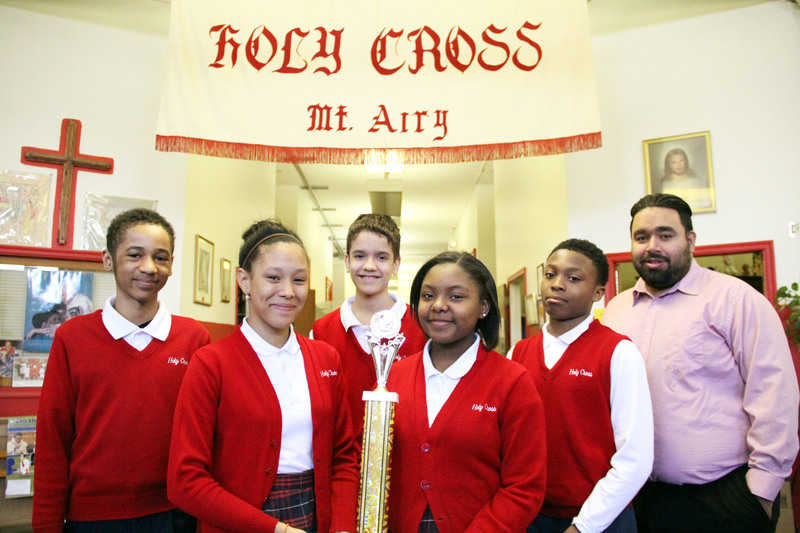 The students who represented it at the competition were part of the Sophia Preparatory Program, a unique initiative at Holy Cross that identifies students who with intensive training cannot only excel but be accepted at the premier college prep schools in the area. The eighth grade students, all taught by math teacher Charles Arroyave, included Kaiya Austin who was the first place winner for girls along with second and third place winners for boys Christopher Peralta and Carl Whittington. Holy Cross (Sophia Program) was the overall winning school at the competition. 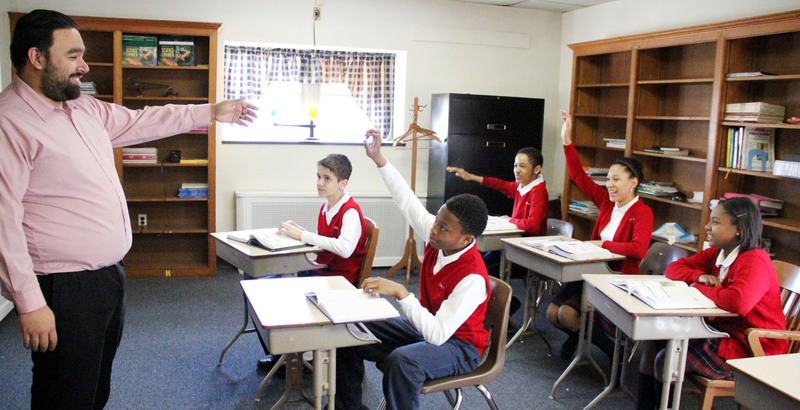 The Sophia Program, which is headed by Trinitarian Sister Rosemarie Jefferson, is really a collaboration between Germantown-based Inn Dwelling and Holy Cross School. Inn Dwelling is a multi-faceted social outreach program that was founded by Vincentian Brother Al Smith, originally to rehab housing for the poor. Brother Al and his assistant director Sister Rosemarie realized educating at-risk children so that they will not live in poverty is just as important as rehabbing tired old houses. Their dream was to start a school that could do just that, but the cost would be prohibitive. Not far away was Holy Cross School, with a student body too small from a financial standpoint to continue. Why not team up with them? Brother Al and Sister Rosemarie reasoned that together they could promote the school to help enrollment, provide some financial assistance and at the same time carve out a pre-prep school program for promising kids drawn from the surrounding area. “We partnered with Father James Cox (then pastor of Holy Cross) and asked, if we helped could he save the school?” Sister Rosemarie said. Father Cox got permission in 2012 from the Archdiocese of Philadelphia to keep the school open for another year as a trial, and that is all it took. Through Inn Dwelling, an unused parish building was renovated as the site for the program. Including the Sophia students, Holy Cross has seen its enrollment grow to about 200 students, according to Sister Rosemarie. Interested students referred to Sophia are given a standardized test, the lower level SAT with a score of 550 as reasonable starting point for admittance. Thirty students in grades six through eight, all either African American or Hispanic American, entered the program, and that continues to be the approximate number enrolled today. The Sophia day is longer than that of the other Holy Cross students; it runs from 8 a.m. to 5 p.m. They share homeroom, gym, lunch, music, technology and art with the main student body, but separate for their much more rigorous programs conducted in their own building. Inn Dwelling pays half the salary of two Holy Cross teachers and also provides $25,000 in tuition aid, according to Sister Rosemarie. The results have been rewarding, she said, starting off fairly close to average. Former graduates have already continued their education at St. Joseph’s Prep, La Salle College High School, Merion Mercy Academy, Mount St. Joseph Academy, St. Basil Academy, Abington Friends and Germantown Friends. At the end of the day the real test is customer satisfaction. Tonya Hines and her husband enrolled their son Delonce at the beginning of the second trimester when he was in sixth grade. They thought the program challenging and tough to adjust to at first. But results trumped everything. “Delonce was forced to put forth effort into all of his assignments, anything else would be unacceptable,” his mother said. “His Terra Nova scores improved in just about every subject, with his math and reading scores ranging above average. She and her husband rave about the program to other parents, not to boast, “but to make them aware of the excellent opportunities Holy Cross offers to the students,” she said. Lisa Dixon, the mother of Kaiya Austin who was tops at the Mathlete competition, said it was the Sophia Program that induced her to send her daughter to Holy Cross and it exceeded her expectations. Kaiya agrees, saying she has been taught and guided by teachers she believes are among the best in the state. Nya Weems, who has been with Sophia for the past two years and will be attending the Agnes Irwin School in the fall, believes she has learned a great deal about herself through the program. Holy Cross is just one of the 15 former parochial elementary schools now run by Independence Mission Schools, educating 4,700 students in underserved neighborhoods.